SmartShare makes the internet smarter! Why should you choose SmartShare instead of other similar products? To understand that, you need to know a little about how the internet works, because it really is about the available amount of bandwidth we have. Or do we? Let us take a look at, how an ordinary internet connection distributes traffic. Three users are sharing an 1,5 Mbit/s internet connection. Now, user 1(with 1 flow) and user 2 (with 1 flow), will get 10% of the available bandwidth each. User 3 (with 8 flows) gets 80% of the available bandwidth. Imagine what it would look like if user 3 had 100 flows! For comparison, an ordinary website as www.thetimes.co.uk generates about 75 flows. The internet is originally designed in a way that the users “steal” bandwidth from each other, when more than one user shares an internet connection. 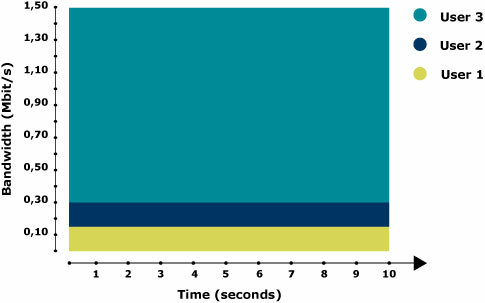 The available bandwidth is distributed according to the amount of flows or sessions that are active on the connection. A person who generates more flows, will get a greater amount of the bandwidth than the users generating less flows. This way of distributing bandwidth origins from the ‘70s, when the internet protocols were designed and computers could only do one thing at a time. But during the past 40 years, the computer technology and the use of the internet has radically changed. How Does The Internet Work With SmartShare? Let us look at the same example as before, only this time a SmartShare is connected to the network. Three users are sharing a 1,5 Mbit/s internet connection. individual user is given to the other users. 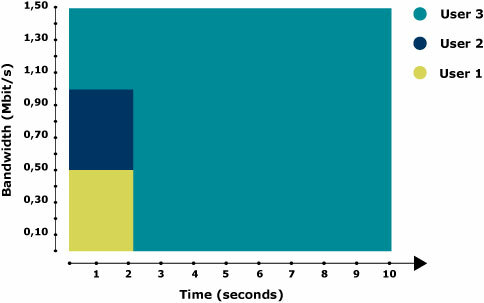 Overall, the users are using the same amount of data as our first example, but user 1 and 2 are already finished after 2 seconds. This leaves all of the bandwidth to user 3, who finishes in the same amount of time as before. SmartShare is connected to the network, and does not read the amount of flows as the key to distribute bandwidth. SmartShare actually distributes the available bandwidth dynamically amongst the number of active users on the internet connection, so nobody can “steal” bandwidth from others. The result is a faster and stable internet without delays. In our digital world we are very dependent on a well functioning internet to get our work done, and SmartShare saves us time, resources and money.